KALISPELL, Mont. (July 27, 2010)-Officials with Bee Broadcasting, TTC Thornton and Montana Raceway Park have announced that the NASCAR K&N Pro Series West race set for August 7 will be aired live on Montana Country 106.3 The Bear. The Rumble in the Rockies Toyota Napa Auto Parts Bonus Challenge features drivers from one of NASCAR's premier divisions including Eric Holmes, Paulie Harraka, Moses Smith, Jonathan Gomez, Greg Purlsey, David Mayhew and many more. Also racing that evening will be the top late models drivers on the West Coast 125-lap shootout featuring Mark Owens, Alex Lessor, Bodie Morton, Billy Salmonsen, Gary Lewis, Brian Lavant, David Garber, Wrango West and many more short track stars vying for a $5,000 payout to the winner. "Having NASCAR come to the Flathead Valley with the K&N Pro Series West is an honor for our facility, the fans who support Montana Raceway Park and the racers who will be here to take part in the weekend events," said general manager and promoter Justin Rody. "The broadcast of the Rumble in the Rockies NASCAR K&N Pro Series West Toyota/NAPA Auto Parts Bonus Challenge will be an exciting addition to an already outstanding night of activities put together by TTC Thornton, Bill McAnally Racing and Bee Broadcasting and it's here at the Flathead Valley 's only professional sporting venue." Leading the play-by-play team will be veteran motorsports writer and announcer, Doug Pace, along with rising on-air talent, Reed Tobol. 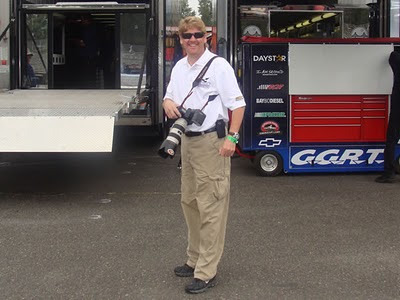 Providing in-depth reports from pit row is former NASCAR driver, Shane Biles, who has won at Montana Raceway Park and is co-host of Northsound Racing heard on KRKO 1380 AM in the Puget Sound area. Fans are encouraged to bring their portable radios to hear all the action from the grandstands. Montana Country 106.3 The Bear has a signal strength that should provide quality sound throughout Western Montana and parts of Southern Canada . 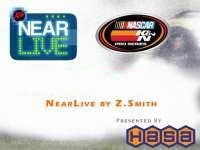 For those unable to listen to the broadcast a near live experience will be offered at racingwest.com . KALISPELL, Montana — Officials with Montana Raceway Park in conjunction with TTC Thornton have announced a two-day ticket package for the NASCAR K&N Pro Series West Rumble in the Rockies set for August 5-7. Also racing that weekend will be the MRP Super Stocks and a 125-lap super late model shootout that offers a $5,000 payout to the winner. Fans will see over 400 laps of qualifying and racing in a two-day period for $50. Purse structures offered that weekend provide over $100,000 in opportunities for drivers in three competitive divisions. The ticket includes admission to Fanfest on Thursday, Aug. 5 with dinner provided by Montana Raceway Park, and on-track autograph session that evening followed by a full racing program on Friday, August 6. Friday will feature super stock and late model qualifying, positioning races, a full test and tune session for the NASCAR West Series competitors with a 35-lap Super Stock main event to wrap-up the night’s program. 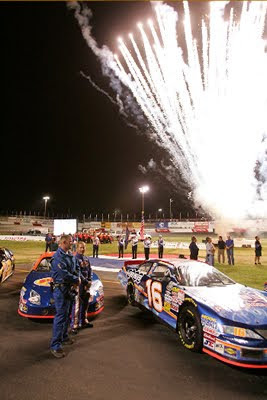 The Best of the West 125 for late model teams and the NASCAR K&N Pro Series West Toyota NAPA Bonus Challenge set for 150 laps of racing on Saturday night highlights three-days of activity. Leading the charge of talent coming for the 2010 Rumble in the Rockies is Eric Holmes, current NASCAR K&N Pro Series West championship points leader. The driver of the No. 20 NAPA Auto Parts Toyota Camry for Bill McAnally Racing got his season off to a rough start in Roseville, Calif.
in late March but since that time has earned six top-10 finishes across the season’s schedule and has a wins at Phoenix International Raceway and Douglas County Raceway. Four-time Coors Light Montana 200 champion, Gary Lewis, is set to return for the Best in the West 125 for the late models and is expected to compete in the Toyota NAPA Bonus Challenge for the West Series competitors. 91011 is encouraged for the fastest news about the Rumble in the Rockies weekend delivered to a fans cellular phone. For more information about Montana Raceway Park, call (406) 257-RACE (7223). The race started out well with Smith, driver of the No. 16 Hasa Pool Products/White Flyer Toyota Camry qualifying on the outside of row eight. By lap 25, the driver from Bill McAnally Racing had climbed into the top-ten. Mario Isola, crew chief for the Hasa entry made the call for Smith to come to pit road for fuel at lap 21 while the field was under caution. At lap 35, Smith would revisit pit road for fresh tires. The great pit stop allowed Smith to move into 6th at lap 39. At lap 50, Smith radioed into his crew that he had “no tack” reading and was heading in where the Hasa team went to work changing out the battery. It caused him to go two laps down and finish in 15th. Smith spent some time meeting the fans and signing autographs in the Hasa Hospitality tent in turn 12. It was a record turnout of Hasa customers and employees at Portland International Raceway. The Bi-Mart Salute to the Troops “125” will be televised on Thursday July 29th on SPEED Channel at noon pacific time. Please check your local listings. The next race for the NASCAR K&N Pro Series West will be at Montana Raceway Park on August 7th. 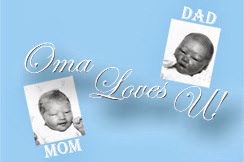 For more information on Moses Smith, please visit http://www.mosessmith.com”. 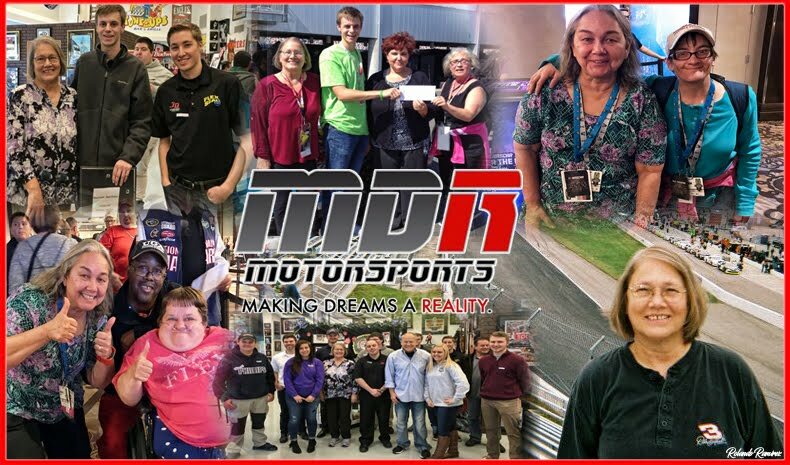 As in the past, NASCAR Race Mom will be providing a Near Live - At the Track experience for all the NASCAR K&N Pro Series West Fans. However this race, NRM will be providing a different 'At the Track' format. You can still interact and ask questions about your favorite driver(s) or events. There will still be lap by lap coverage of the race. However, now the 'At the Track' coverage will be held off-site. To follow all the exciting action of the race weekend; click here to be re-directed to the Racing West Site. Please comment here after the race with your opinion and/or advice regarding the new format. The race … The Bi-Mart Salute to the Troops 125 is the seventh event in a 12-race series 2010 schedule this year for the NASCAR K&N Pro Series West. It is the second of three road-course races. The procedure … The starting field is 28 cars, including provisionals. The first 24 cars will qualify through two-lap time trials. The remaining four spots will be awarded through the provisional process. The race will be 63 laps (125 miles). The track … Portland International Raceway is a 1.98-mile road course. The track hosted one NASCAR K&N Pro Series West event in 1986, which was won by Hershel McGriff, and one last year, which was won by Jim Inglebright. The records … Qualifying: David Mayhew, July 19, 2009, 93.386 mph, 76.328 seconds; Race: Jim Inglebright, July 19, 2009, 58.332 mph, 2 hours 14 minutes 38 seconds. McGriff returns … Hershel McGriff (No. 04 Park Corp Chevrolet) will be back in action at Portland International Raceway, at the age of 82. Two longtime veterans in the NASCAR K&N Pro Series West will be adding to their list of career marks at Portland. The legendary Hershel McGriff (No. 04 Park Corporation Chevrolet) will be making his 239th career series start since 1971, which is a record for the modern era. Jack Sellers (No. 15 Greyhound Adoption Center Chevrolet) will be making his 237th start, moving him into a tie on the list of career series starts in the modern era with Bill Schmitt. As the NASCAR K&N Pro Series West passes the midway point of its 2010 season, the challenge for the championship has shaped up into another tough points battle that extends throughout the top 10 and beyond in the standings. As was anticipated this season, newcomers to the series have added to the action and made for another season of tough competition as the West’s oldest stock car circuit celebrates its 57th season. Six races have produced five different winners, with two first-time series winners. The first half of the season has also featured five different Coors Light Pole Award winners. Four different drivers have led the standings since the season started in March, with two-time series champion Eric Holmes (No. 20 NAPA Toyota) currently out front by a 64-point margin. 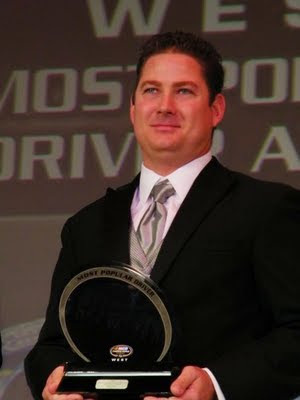 If successful in his quest for a third title – the 35-year-old driver from Escalon, Calif., would become just the seventh driver to win three or more championships in the series that was initially known as the Pacific Coast Late Models and then as the NASCAR Winston West Series. Holmes – who could also deliver Bill McAnally his fifth series championship as a car owner – has accumulated 937 points; with two wins, four top five and five top 10 finishes in the first six races of the season. Despite finishing outside the top 20 in the past two events, series veteran David Mayhew (No. 17 MMI Services/Ron’s Rear Ends/KHI Chevrolet) has been able to retain a solid hold on second in the standings with 873 points. Mayhew, who led the standings through two events, has one win and four top five finishes. Drivers chasing Holmes and Mayhew in the championship standings have shuffled positions with each event, with only 110 points currently separating the nine drivers in third through 11th in points. Jonathon Gomez (No. 22 Heritage Cattle/Century Boatland Chevrolet) of Twin Falls, Idaho, is third in the standings with 843 points. Gomez, in his first full season of competition in the series, has two top five and four top 10 finishes. Series veteran Moses Smith (No. 16 HASA Pool Products/White Flyer Toyota) is seven points back from Gomez in fourth with 836. The Tempe, Ariz., driver has two top five and four top 10 finishes this season. His Bill McAnally Racing teammate, Paulie Harraka (No. 12 NAPA Gold Filters Toyota), is 12 points further back in fifth with 824. The 2009 Sunoco Rookie of the Year from Wayne, N.J., has one win and three top five finishes. Heading up this year’s talented rookie class is Luis Martinez Jr. (No. 6 King Taco/Sunrise Ford/Lucas Oil Ford), of Long Beach, Calif., who is 29 points back from Harraka in sixth with 795 points. Just two points behind him is second-year driver Blake Koch (No. 21 Daystar Chevrolet) of West Palm Beach, Fla., with 793 points. Another member of the freshman class, Michael Self (No. 88 Johnny Walker Performance Center/Team Viva Chevrolet) of Park City, Utah, is seven points back of him with 786. He is followed by another rookie, Todd Souza (No. 13 Central Coast Cabinets Chevrolet) of Aromas, Calif. – who is 38 points back of him with 748. Greg Pursley (No. 26 GPM Performance Parts/Star Nursery Ford) – a veteran driver from Southern California who moved to Parker, Ariz., a year ago to be near his team – is three points further back in tenth with 745. Another of this year’s rookies, Josh Combs (No. 9 Grape King/Sunrise Ford/Lucas Oil Ford) of Sacramento, Calif., is 12 points out of 10th place with 733 points. Competition in 12th and beyond in the standings is tight, as well. Johnathan Hale (No. 5 Greyhound Adoption Center Chevrolet) of Rio Linda, Calif., holds down the 12th spot with 669. Just five points back from him is series rookie Travis Milburn (No. 14 Cooks Collision Toyota) of Eagle, Idaho, with 664. Long-time series veteran Jack Sellers (No. 15 Greyhound Adoption Center Chevrolet) of Sacramento, Calif., is 19 points back from there with 645. Trailing him by 15 points is rookie Greg Rayl (No. 07 Spectator Racing Ford) of Roseville, Calif., with 630. Troy Ermish (No. 38 Datsun Parts Outlet Chevrolet) of Fremont, Calif., is 16th in the standings with 579. The next race on the NASCAR K&N Pro Series West schedule is the Bi-Mart Salute to the Troops 125 at Portland (Ore.) International Raceway on Sunday, July 18. Races on the NASCAR K&N Pro Series schedule this year are televised on SPEED, the nation’s first and only cable television network dedicated to automotive and motorcycle racing, performance and lifestyle. The events air on Thursdays at 6 p.m. ET. 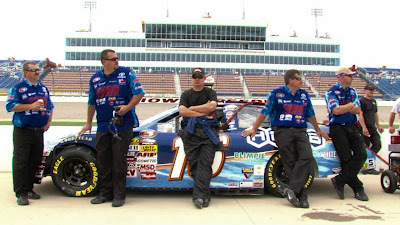 K&N Engineering became the title sponsor for NASCAR K&N Pro Series at the beginning of 2010, entitling NASCAR’s top developmental series – the long-standing Grand National Division, East and West Series. The Riverside, Calif.-based K&N Engineering is the inventor and leading innovator of reusable cotton gauze filter technology for automotive applications. 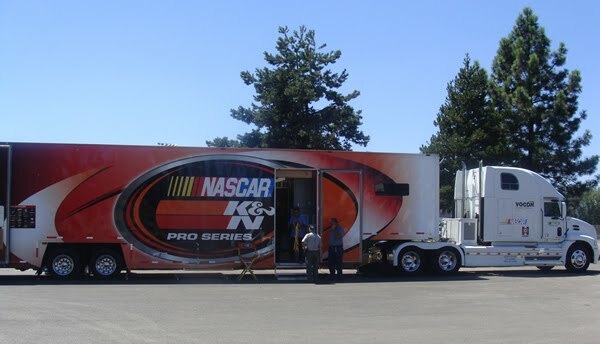 K&N, which has grown from a family-run business to a global company, traces its involvement with NASCAR back to the days of supplying parts for the NASCAR Sprint Cup Series races at the old Riverside Speedway. Moses Smith continues his climb to the top of the points standing in the NASCAR K&N Pro Series West chase for the championship as the series next heads to Portland International Raceway. He is currently fourth in points. The No. 16 Hasa Pool Products/White Flyer Toyota team is on the road to one of Smith’s favorite tracks. The Bi-Mart Salute to the Troops “125” will be televised on Thursday July 29th on SPEED Channel at noon pacific time. Please check your local listings. Visit www.portlandnascar.com for ticket end event information. Discount tickets are also available at local Portland Bi-Mart stores while supplies last. 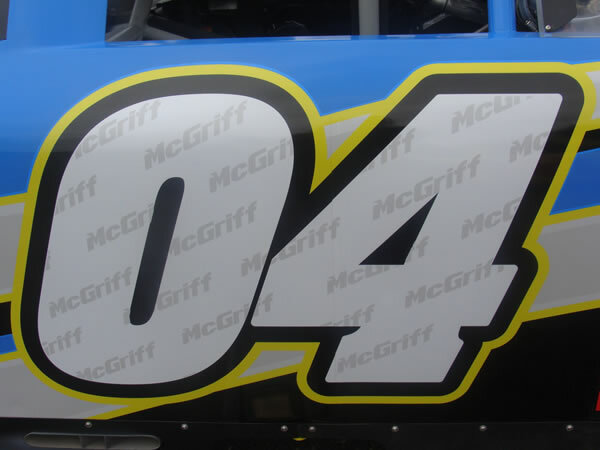 For more information on Bill McAnally Racing and the No. 16 Hasa Toyota team, please visit our website at www.billmcanallyracing.com. Greg Pursley is not new to the racing community. Beginning his racing career with motorcycles, he moved on to racing in the late model class on the road course at Willow Springs Raceway in SouthernCalifornia. His pursuit of NASCAR late model stock car competition included racing at Mesa Marin Raceway in Bakersfield, and Toyota Speedway at Irwindale. Pursley finished the NASCAR Southwest Tour fifth in the championship standings in 2000. Pursley made his debut in the NASCAR K&N Pro Series West in 1999. He ran just one race that year and did not return until 2002. He competed for a full season in 2002 and finished ninth in the championship points. 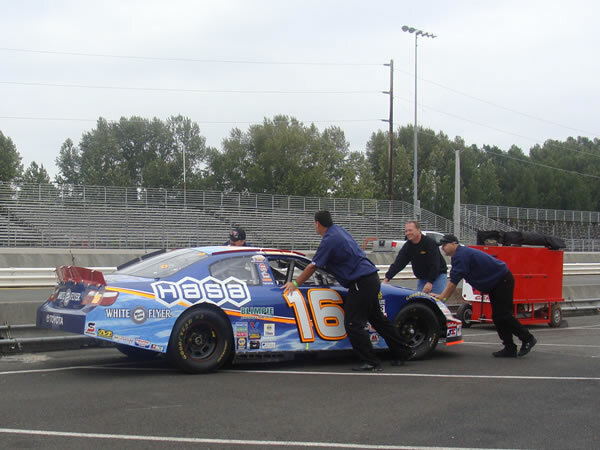 After his K&N Pro Series West foray, Greg Pursley focused on competing at the Toyota Speedway. He really came to the forefront when he won one of the most coveted and difficult championships a driver can win in 2004 - the NASCAR Weekly Racing Series National Championship. Pursley's championship season can be summed up by the numbers: 13 wins in 18 starts! 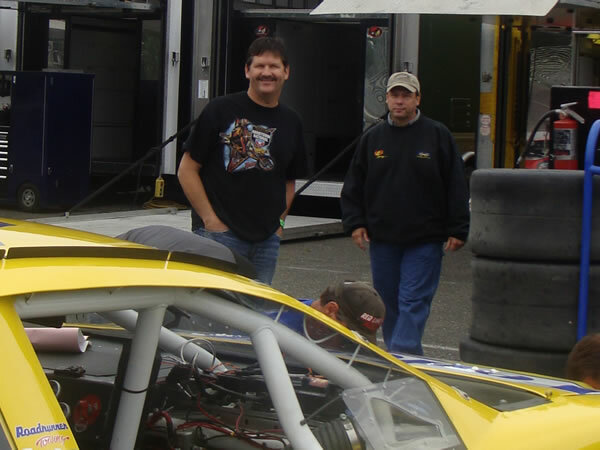 After the National Championship, Pursley began working as a crew chief for Gene Price. That progressed into him driving a Gene Price Late Model to NASCAR Toyota All Star Showdown win in 2007. From there, a partnership formed. Greg Pursley returned to the K&N Pro Series West in 2009 with Gene Price Motorsports. One win, five top-fives, and seven top-tens earned them a third place in the championship points. No, Greg Pursley is not new to the racing community nor to winning. Nonetheless he was new to the Camping World Truck Series. However, his varied and vast experience enabled him to debut the #162 Chevrolet with a respectable sixth place qualifying position. Although his race included a brush with the wall and an assisted spin to the infield, Pursley finished the race with an impressive eighth place finish. Knowing Greg Pursley’s racing history; it would be a surprise if he did not turn this opportunity in another bright footnote in his chosen profession. NASCAR Race Mom: At the drop of the green flag, you got an awesome start that propelled you from your sixth place starting position into fourth. Please describe that start and what it did for your confidence level. Greg Pursley: We had a really good truck and I really enjoy running at Iowa Speedway. Being able to run with the guys up front that you watch every week on TV was a real confidence booster. NASCAR Race Mom: Around lap 70, the #62 went high and hit the wall. On lap 116, Hornaday got into the back of your truck and spun you around and into the infield. While these two incidences earned you the Dodge “Save of the Week;” what kind of damage did the truck endure? Greg Pursley: It’s just body damage. As you saw, we still had a great handling truck. On lap 70, I just brushed the wall trying to run the high groove. NASCAR Race Mom: The race ended with an exciting Green, White, Checkered finish. You were able to advance one position for an eighth place at the line. What were your thoughts during the last laps of your race? Greg Pursley: We ran side by side with Ricky Carmichael earlier in the race and I knew we had a better truck than he did. I wanted every position I could get. Never give up until the checkers fly. NASCAR Race Mom: You’ve had some tough luck recently at the Iowa Speedway in the K&N Pro Series West. How did your experience at this track in the K&N Pro Series West help you in your Camping World Truck Series debut? Greg Pursley: We’ve been to Iowa Speedway four times, ran really well all four times but unfortunately have no good finishes there until now. I knew we had a great truck after testing it at Pike’s Peak so I felt confident we'd do well. NASCAR Race Mom: Did you use your K&N Pro Series West pit crew? Greg Pursley: It was a combined effort from our K&N team and “Pit Crew Management” from back East. They ALL did a great job for us on every stop! 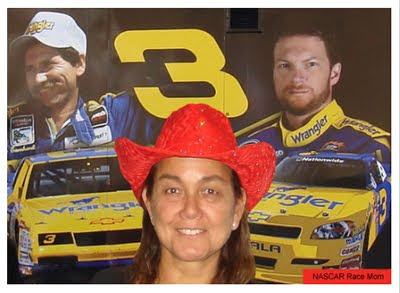 NASCAR Race Mom: Can you give us a preview of your 2011 racing plans? Greg Pursley: Well right now we’re excited about heading to Portland for the road race in the K&N Series next weekend. We’re also planning on running at least three more truck races (definitely Phoenix); we’ll decide which races after Portland. As far as 2011, we’re working out our details now. With the NASCAR Sprint Cup series in respite until July 25, 2010; will the K&N Pro Series West draw some regular NASCAR Cup Series Drivers? 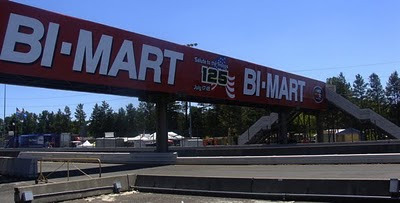 The Bi-Mart Salute To The Troops "125" will be run at the 1.98 Mile Paved Road Course of Portland International Raceway. Twenty-Eight drivers will take the green flag on July 18th at 3:00 p.m. 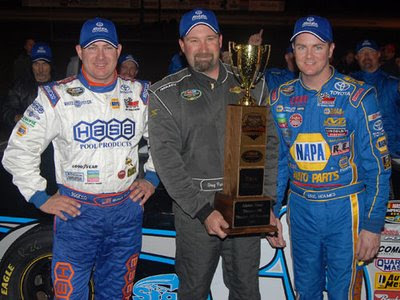 In the past, several Cup Drivers have participated in K&N Pro West Series. 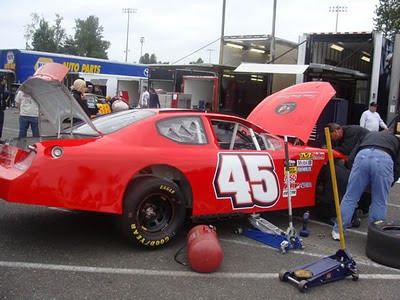 The first road race of the 2010 K&N Pro Series West season, held at the Infineon Raceway in June, had Mattias Ekstrom, David Gilliland, and Boris Said in the line-up . David Gilliland and Joey Logano participated in the June 20, 2009 Infineon Raceway event. Will the entry list for the next NASCAR K&N Pro Series West feature a NASCAR Sprint Cup Series Driver? NASCAR Race Mom believes it might. Hershel McGriff To Return To Portland International Raceway. McGriff strives to augment his legacy in NASCAR history bookd by qualifying for and racing in the BI-MART Salute To The Troops "125" at the Portland International Raceway this month. 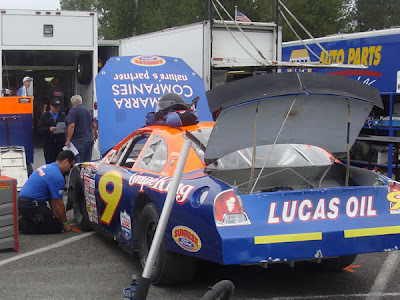 PIR is a 1.98 Mile Paved Road Course and has hosted two K&N Pro Series races in the past. 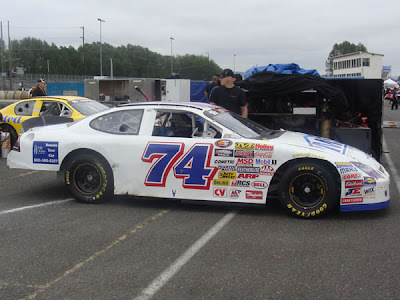 Hershel McGriff won the first K&N Pro Series race there in 1986 and finished 13th in 2009. This year the field will be limited to twenty-eight drivers and consist of sixty-three laps (125 miles). Should Hershel McGriff win this race, he would become the oldest driver to ever win in one of NASCAR’s premier series. Thanks to everyone's wonderful efforts, NASCAR Race Mom was selected as the winner of week 5 in the M&M’s Most Colorful Fan competition. NRM could not have done it without all our awesome networking buddies! Winning the week is just the first part of this NASCAR Dream. It qualifies NRM for the final round. The Grand Prize Winner of that round will receive a three (3) day/two (2) night trip to the NASCAR Hall of Fame Museum in Charlotte, North Carolina (“Museum”). The trip shall include the following: round-trip coach-class airline tickets from the major U.S. gateway airport nearest the Grand Prize Winner’s residence to a Charlotte, North Carolina-area airport for Grand Prize Winner and one guest. During that trip; the grand prize winner’s entry will be featured in the NASCAR Hall Of Fame! Now that would be a NASCAR Dream come true. 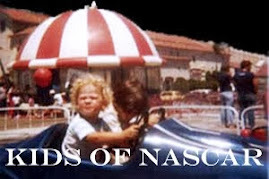 NASCAR Race Mom would love to be able to provide the NASCAR Hall of Fame with her philosophy of the Greatness of NASCAR blended with the Strength of the racing family! What better way to do that then to honor the Earnhardt family for their contribution to the NASCAR Legacy. Both Dale Sr. and Dale Jr. have personified a caring and giving personality. September 27, 2010 through October 3, 2010 is the voting period for the final round. You can bet that NASCAR Race Mom will be asking for your help once again! However for now, we need not vote anymore! Again thanks for getting NRM through stage one! You support was really appreciated. PLEASE NOTE: This is a date change from what originally appeared on the broadcast schedule. A Fourth Place Finish for the 4th of July Weekend. You could not have requested better weather for the 4th of July weekend of racing at the Toyota Speedway. The NASCAR K&N Pro Series West held their sixth race of the season under the mild 80 degree Southern California blue skies. The number 16 Hasa Pool Products team was optimistic and working hard to keep their streak of top-ten finishes going. 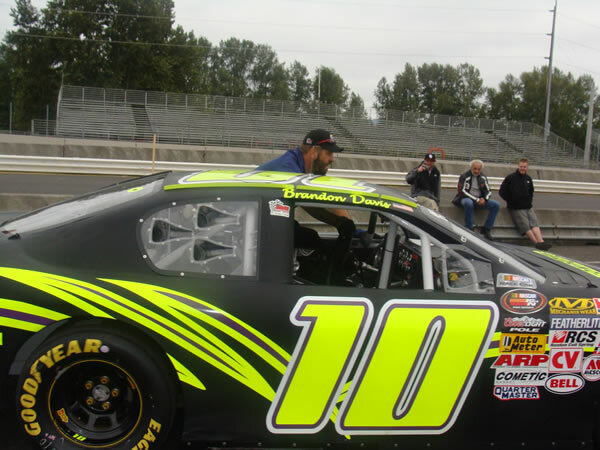 Moses finished fourth on June 5 at the Douglas County Speedway and ninth on June 19 at Infineon Raceway. The car worked well right off of the trailer. With two full practice sessions, the team felt their car would be very competitive during the nighttime race. Moses qualified fourteenth out of the thirty car field. 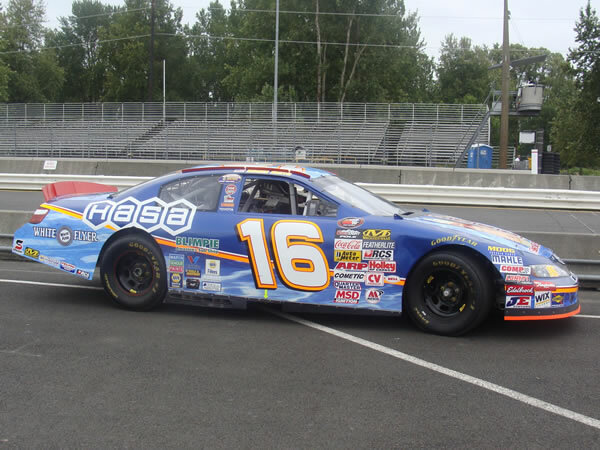 From the drop of the green flag, the #16 Hasa Pool Product Toyota Camry moved steadily towards the front of the field. With some very exciting three and four wide battles, Moses quickly worked his way up into the top-ten. In lap 77, two competitors collided in the middle of turn four. Moses just barely missed the wreck and had to fight to keep his vehicle under control as it maneuvered through the turn. Lap 100 brought out the Competition Red. All the cars were mandated to pit. Moses restarted Lap 101 from the sixth position. During the next twenty laps, Moses patiently worked himself into second place. 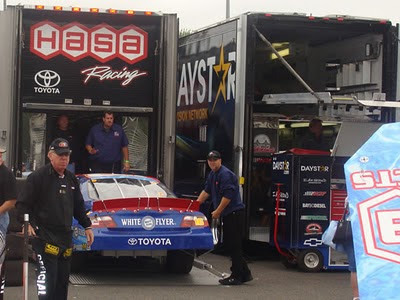 However, the #16 Hasa Pool Product Toyota Camry began experiencing an alternator issue and it affected the car’s horsepower. (An alternator is an electromechanical device that converts mechanical energy to electrical energy in the form of alternating current.) Despite the decrease in horsepower, Moses hung on for a 4th place finish. 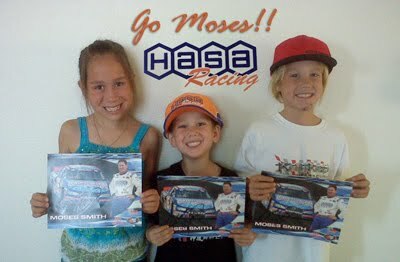 Both Moses and the team were thrilled that they were able to put on such a good show for the over four hundred Hasa fans who attended the Hasa Hospitality event and race. "What an awesome race! Have to thank my crew for all the hard work they have put into turning our luck around this season. We are really on a roll, and it showed Saturday night in front of over 400 Hasa fans. I am excited to keep this momentum going heading into another road course in two weeks." The King Taco ‘200’ will air on SPEED on Thursday, July 15 at 3 p.m. (Pacific Time). The next event on the NASCAR K&N Pro Series West schedule is the Bi-Mart Salute to the Troops “125” at Portland International Raceway (Oregon) on July 18. With his top-5 finish, Moses has climbed up to fourth place in the NASCAR K&N Pro Series West championship point standings; just seven points out of out of third. Eric Holmes-937; David Mayhew-873; Jonathon Gomez-843; Moses Smith-836; Paulie Harraka-824; Luis Martinez Jr.-795, Blake Koch- 793; Michael Self-786; Todd Souza-748; and Greg Pursley-745. At the Track - King Taco "200"
As in the past, NASCAR Race Mom will be providing a Near Live - At the Track experience for all the NASCAR K&N Pro Series West Fans. However, starting this race, NRM will be providing a different 'At the Track' format. You can still interact and ask questions about your favorite driver(s) or events. There will still be lap by lap coverage of the race. Vote for Moses Smith For NASCAR K&N Pro Series West Most Popular Driver! Online voting is under way for the Most Popular Driver of the Year award in the K&N Pro Series West. 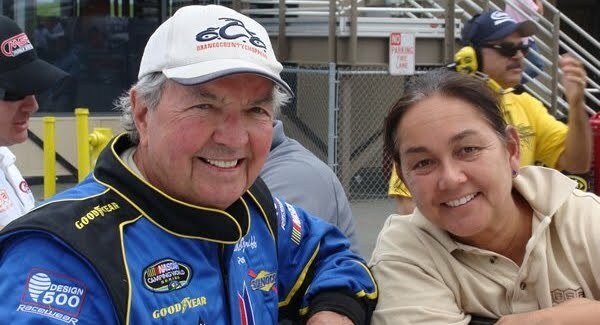 The link to the 2010 K&N Pro Series West Most Popular Driver ballot will be hosted on www.nascarhometracks.com. Again this year, fans also may write in their favorite driver if he / she is not among the nominees for a specific series. Fans can send an e-mail to fanfeedback@nascar.com and submit their write-in vote. Fans may vote or submit a write-in candidate once per day and are encouraged to vote throughout the season. Voting continues until Nov. 13. Last year, Moses Smith was voted by the fans as the Most Popular Driver in the K&N Pro Series West. Voting for all regional touring series will be available on www.nascarhometracks.com, voting for the Nationwide Series is available at www.nascarnationwideseries.com and Camping World Truck Series voting can be accessed by visiting www.nascar.com. Results will be announced at the NASCAR Night of Champions Touring Awards Gala on Saturday, Dec. 11 at the Charlotte Convention Center's Crown Ballroom in the NASCAR Hall of Fame. select Moses' name and click on the "Submit Button."